There have been a few occasions since the onset of my ME/CFS that I have broken down from frustration and utter physical weakness. I’ve even had a few panic attacks, and every time I have a breakdown or meltdown, I remember the first one because it was incredible. It was before my diagnosis, we were still doing test after test at doctors surgery, then at the hospital across the city, it was exhausting and worrying because they could never find anything wrong, they couldn’t find an explanation or any biological sign of what I was experiencing. Each test result would be a mix of relief and disappointment, frustration and fear as we moved down a list of some horrible illnesses and infectious diseases trying to find the cause of my pain and weakness. This particular day they were testing my heart after I had fainted in the endocrinologist’s department where they had tested me for Adrenal failure. Once again they found nothing wrong. As I left the Cardiology department with 2 friends who had accompanied me, I just broke down and sobbed. I couldn’t walk any further or talk or hold it in any longer. It just came over me like an uncontrollable wave and I just had to let it all out. It was at this point that my dear friend pulled me close and started praying in my ear as she held me. The calm peace that came over me within moments was awesome. What felt so chaotic and uncontrollable just moments earlier had turned into peace and joy. This is what happens when we dwell in the presence of our Lord. This is what happens when we keep our eyes on Him. My circumstances hadn’t changed, only my focus did. He was always there, I just wasn’t looking for Him, so I didn’t see Him. He never left my side, but I wasn’t focused on His faithfulness and closeness, I was focused on my weakness and fragility instead of His strength and love. Lets not get so focused in our own pain that we forget to look at the One who has overcome it all for us already. 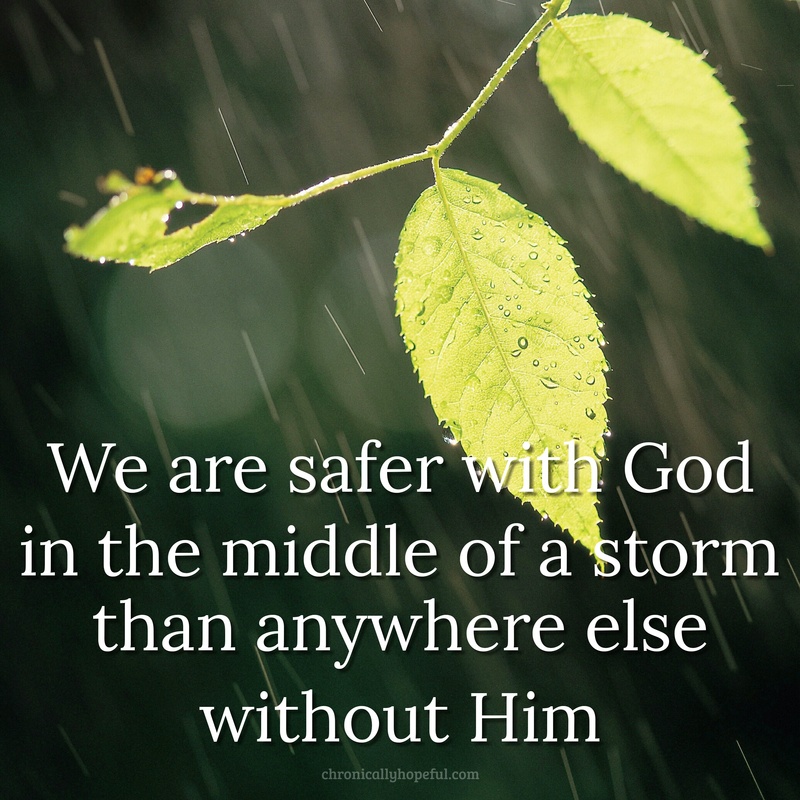 If you’re in the storm with Jesus, then you’re safe, whatever happens, whatever it may look like from the outside. He won’t always calm the storm, but He will calm you in the middle of it, if you focus your eyes on Him. Keep your focus on the eternal perspective. Turn your eyes upon Jesus, look full in His wonderful face and the things of this world will grow strangely dim in the light of His glory and Grace. How beautiful that your friend quietly prayed for you in a real time of need. That is such a blessing.? Yes! She is an amazing human – a calming, loving presence. I really am blessed to have her in my life. She’s just about the only one who has stuck around and still makes time for me all these years I’ve been ill.